Daniel Gaffey is a bit of a mystery man. We don't know when or where he was born, or died. Did one of those Gaffeys escape and head north to Ulster, and settle for anonymity in the foothills of the Mountains of Mourne in County Down to raise a young Daniel Gaffey? Unfortunately, records of the area are few and far between – even information on births, deaths and marriages is sketchy. Under the restrictions imposed on the Catholic population of Ireland, Catholic churches in the province were not allowed to keep registers much before 1825, and those of Clonallon Parish, near Newry in County Down, between 1826 and 1830 are very sketchy, although Daniel's name is recorded as witness to a marriage there in August 1828. However, digitised records from the Catholic Church in Newry itself do show Daniel marrying Mary Turley there in September, 1825, (with a fee for the ceremony of £1/5/5). Daniel and Mary's children were baptised in a village chapel in Clonallon parish, near the land Daniel worked as a tenant farmer. We do know, from the records that do exist, that Daniel Gaffey had at least seven children with one of them apparently dying early - a William, baptised in 1828, appears not to have survived, and his parents re-used the name for a later child, born in the 1840s. Daniel led the life of an Irish tenant farmer in the first half of the 19th century on his allotment in the townland of Croan, near Mayobridge. There's an intriguing entry in the NSW death certificate of Daniel Gaffey's son, another Daniel: his fathers's occupation was given as " hatter". Surviving records of the time suggest that if the Gaffey children went to school, it would have been to the small National (Catholic School) in Mayobridge, near the Catholic chapel. The school was a "small slated cottage", established in November 1832. However, the fee for each pupil was one shilling per quarter - but despite this, it had an enrolment in 1836 of 103 boys and 48 girls, all of them Catholics. It's more than likely that the Gaffey children did not attend - or if they did, the lessons they learned weren't long lasting, as more than a few of them appear to have been illiterate, signing their names with crosses in later documents. According to the same records, the Catholic chapel was a roughcast and whitewashed stone building on the main road between Warrenpoint and Rathfriland, which passed through the crossroads of Mayobridge. It was built in 1806 at a cost of £1000, and, in 1836, the average total attendance at the Sunday Masses was 1,400 - so it's more than likely Daniel, his wife Mary (Torley) and children were among the congregation. The church has since been replaced by a more imposing bluestone Gothic structure. (right): Mayobridge, a small picturesque village eight kilometres from Newry, in County Down, Northern Ireland. 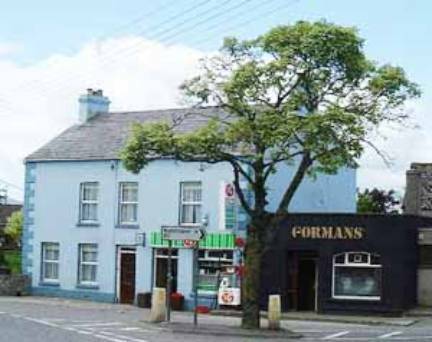 Today (2000), old houses of the village are centered around Gorman’s pub and a shop but the village is expanding with many new houses being built on its outskirts. In 1834, in the Tithes Applotment books for the Parish, Daniel is listed as an occupier of land in the old townland of Crone (more usually spelt Croan) in Clonallan Parish. The nearest village, Mayobridge, was about three kilometres to the south of Daniel’s rented land which totalled 7 acres, 2 roods, and 34 perches, over four allotments. The main crop in the area, as noted by the Tithe clerks, was oats, which sold at an average price of 13s 3p 3f per barrel; as well, there were two linen mills close by. The Gaffey’s landlord was the Meade family, who owned considerable property in the province. They were absentee landlords, keeping mainly to their estate in England, with their interests looked after by an agent, Crane Brush. The welfare of their tenants was never uppermost in their minds – in the mid 1840s, they decided cattle and sheep were more profitable than tenants and less of a liability, and Brush refused to renew many leases, thus pushing many families into emigration. By the time the Griffiths’ Valuation of the Croan townland was carried out in 1845-48, Crane Brush’s plan had been largely successful. The number of occupied houses had been reduced to four, instead of the dozens listed there only 15 years earlier, in the Tithes’ survey. The Gaffeys were not among those still living there during the Valuation. Daniel was possibly a victim of the Irish Famine of 1845-46, or he and his family may have been forced out to England by his landlords. What is certain is that Daniel had died by the time the surviving members of his family, led by his eldest son Patrick, made the move to Staffordshire in England, then to Australia, where they settled in the New England district of New South Wales over the period 1857-62. Clonallon was both a civil and an ecclesiastical parish. Sean McCartan, an Ulster history researcher.